1780 – Battle of Cape St. Vincent. This was a sea battle between Spanish and British ships. The forces at Gibraltar were under siege by Spain and the British fleet resupplied them by sea. The Spanish fleet intercepted them off the southern coast of Portugal. This was also known as the Moonlight Battle as the fight began in the afternoon and continued into the night under a full moon. The Spanish were defeated by the larger British force and Gibraltar was resupplied. The battle was part of the Anglo-Spanish War, which because it took place during the Revolutionary War, was of great significance to America. Spain was an ally of France, and when that nation joined forces with America, it also aided in the fight for independence. So despite losing that battle, Spain, along with France helped defeat England in a different war. I never knew that we also owed a debt of gratitude to Spain, but then again, did they ever give us a statue? 1862 – Hartley Colliery Disaster. Hartley Colliery was a coal mine in Northumberland, England. During a shift change, when there was double the number of miners at the bottom of the shaft, a beam supporting a steam engine used to pump water from the mine broke. Twenty tons of machinery plummeted down the shaft, blocking any escape. Gases and water filled the mine, killing the 204 men and boys below. The youngest victim was 10, the oldest was 71. The mine was a single shaft mine so there was no other way out. The disaster forced a change in laws so future mines had to have a second shaft as an avenue of escape. The second shaft requirement was one of those pesky government regulations that are now politicized as an infringement on the rights of society as a whole. Whereas what we really should be concerned about is that the rights of a corporation are never violated. That potential travesty is being addressed by the current administration. After all, corporations are people also. 1954 – “South Pacific” closes. The Broadway musical had opened in 1949 and had run for 1,925 performances. A Rodgers and Hammerstein production, it was based on a Pulitzer Prize winning book, Tales of the South Pacific, by James Michener. Set during WWII, the plot and theme dealt with racism. The early 1950s in America were not a time of racial enlightenment, and the play created controversy. Rodgers and Hammerstein stood by its message and were rewarded for it. “South Pacific” was a financial success and won ten Tony Awards. Samuel Goldwyn, movie mogul, rejected screenplays that had a message. He famously said, “If you got a message, send a telegram.” Rodgers and Hammerstein flew in the face of that advice and were successful. Responsible, along with his brother, Edouard, for the inflatable, detachable, rubber tire. They were engaged in a farm equipment business in France that utilized rubber for belts, valves etc., when one day a bicyclist came in with a flat tire. Bicycling was very popular in the last decades of the 19th century, and tires had progressed from solid to inflatable rubber. However they were glued to the rim, so changing a flat was a laborious ordeal. Edouard worked on it, and in 1891 they were granted a patent for a detachable tire. The next step was applying the same technique to automobile tires. 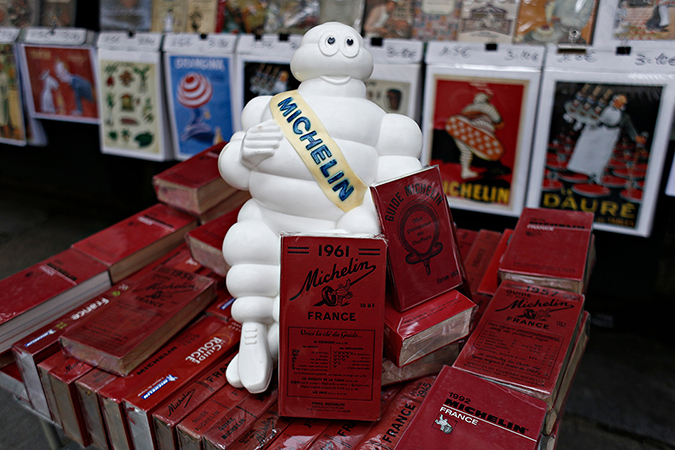 The Michelin name is still a respected one today in the world of tires [ and restaurants], and the brothers were elected into the Automobile Hall of Fame. I didn’t know there was an Automobile Hall of Fame. Who would’ve thought? But as an avid bicyclist, when I get a flat, I’m certainly happy the tire isn’t glued to the rim. Okay, time for another pop quiz. Where is the Automobile HOF located? A. Dearborn. B. Detroit. C. Flint. D. Toledo. She did seem to channel big apes quite well. I saw “Mighty Joe Young” as a six-year-old and it had quite an impression on me. I don’t know if it would hold up if I saw it again, but at the time she did a good job of getting me to empathize with a big gorilla. Her private life was big and bawdy also. Already married and divorced three times, she had an infamous short-term marriage to actor Ernest Borgnine. Probably fueled by alcohol, they married on impulse in June, separated in August, and were divorced by November, all in the same year. The fights reportedly started on their honeymoon. In her memoirs, Merman devoted a full chapter to her marriage to Borgnine. It consisted of one page, left blank. I once saw an interview with Borgnine in which he humorously described the marriage. My take was that they were two very similar people who did not like what they saw in the other. It’s difficult for two larger than life characters to occupy the same space. Answer to quiz: A. Dearborn, Michigan.